This gloved all the way from the other side of the United States to my home for me to repair it. It is not what i would actually call a hole even though you can see one. 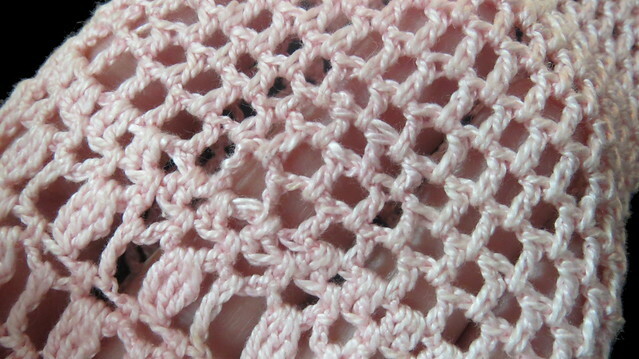 When I inspected it, it is actually a runner like you get in stockings , and knitting but this is crochet. Most people do not know you can get them in crochet too. 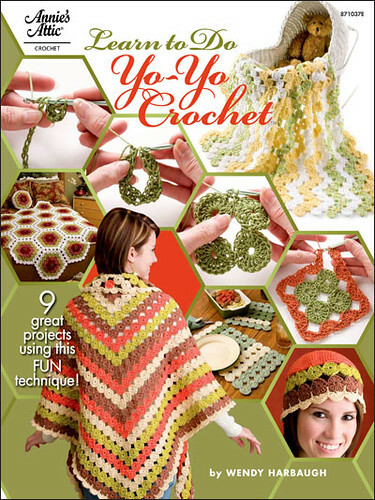 But in crochet it is a dropped yo. 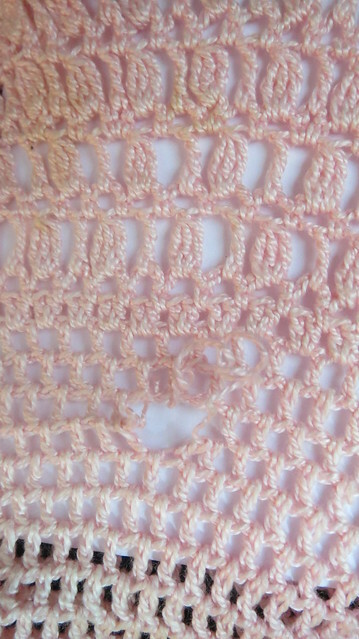 So when the person who created this many years ago was making the double crochet she actually missed the loop and it was left hanging sort of tight connected by the pressure of the other stitches around it but in time with wear and washing it worked its way free and started to run. 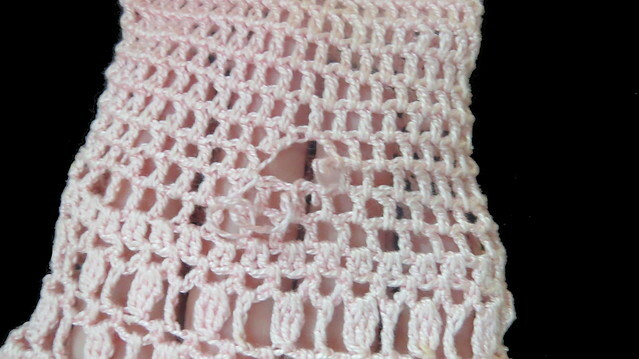 I had to re-crochet the missing part and add a small piece of vintage pearl cotton in a similar color and hold that dropped stitch. Weaver in the two new tails and it was finished. Usually you would have had four tails for a hole the two original tails and two from the new crochet. But in this type of repair the thread is totally enact no break so you just have the two new tails holding that dropped loop. Below is the finished repair the first photo I am pointing at it in the next see if you can see it. Click on bottom photo to be taken to flickr where there will be a note and a box telling you where the repair is if you think you found this will tell you. If you guessed correctly let me know or if you guessed wrong. I mean i did give you a large hint with the picture right above it should have been easy to find. I am trying to figure out how invisible this repair is. I can see it but I do not know if others can. 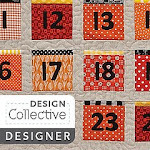 My clue is my stitches are a tinny bit shorter they had to be as one stitch had to be created that was never there thus the runner that engulfed a few mesh blocks. 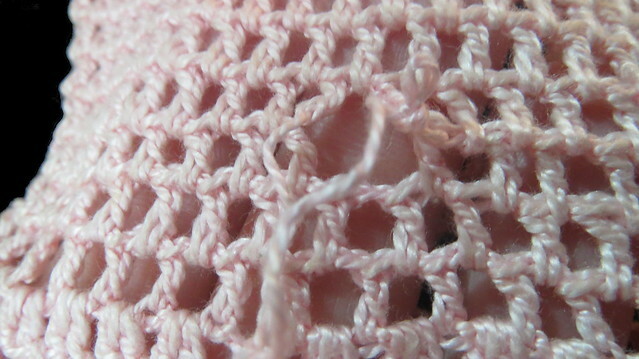 So I had to make everything a little shorter to get enough thread to make that stitch after a washing the stitches will expand and loosen so then I should not even be able to see it any more. You did a great job, I can only see it because it was pointed out in the first photo. The only way I could tell where the repair was is because you were pointing to it. I never would have known there was a repair at all! Adorable! That is so easy but so lovely. Thank you for sharing.